The strategic approach companies take to manage and grow its most important customers. By implementing a KAM strategy, you create opportunities for both you and your clients to sustain and grow your businesses—as well as opportunities to bring in more revenue. 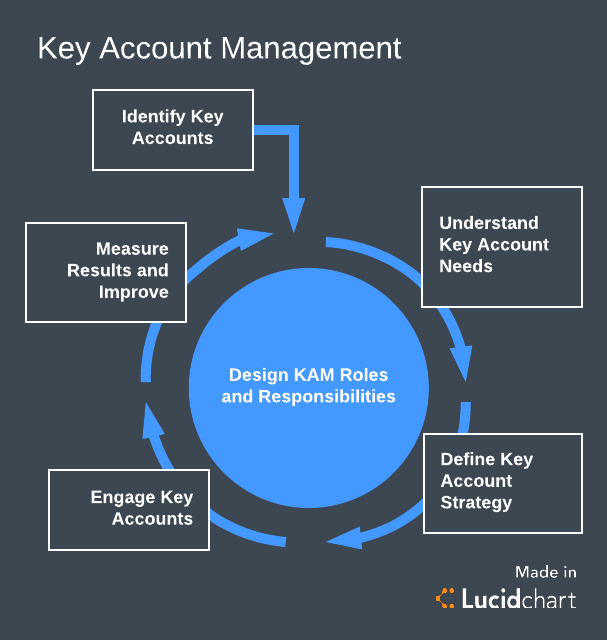 Every organization has a different definition of key account management (KAM). In general, the term refers to the strategic approach companies take to manage and grow its most important customers, but the way each company determines who their key customers are, how to approach them, and what they’d like to gain will change dramatically. If you haven’t created a key account sales strategy specifically for your business and your clients—or if you are looking for ways to improve your current key account management process—take a look at our tips below. As we stated previously, key account management is the approach a company or salesperson takes to manage and grow an organization’s most important accounts. The ultimate purpose of KAM is to develop long-term, mutually beneficial relationships with specific businesses in order to meet strategic goals and optimize value in both companies. Why does your company need a key account sales strategy? By implementing a KAM strategy, you create opportunities for both you and your clients to sustain and grow your businesses—as well as opportunities to bring in more revenue. A solid KAM process gives you the opportunity to not only create a stronger relationship with valued clients but also to mitigate competition, as you’ll have a strong enough relationship to withstand almost anything the competition can throw at you. Increase the average size of sales deals. Become valued partners to your clients. Develop and improve business relationships. Generate awareness for your company. Whether you have your process nailed down or are just starting to use key account management, keep these best practices in mind to improve your overall strategy. You can’t choose just any of your clients as key accounts. You’re going to spend a lot of time and company resources on this account, so choose an account you think will significantly benefit your company and deliver a large amount of revenue. This process may involve researching your client's current business plan, objectives, and overall financial health. When researching your clients, pay close attention to the clients who are more likely to grow with you in the future or have been the most consistent and loyal. If you’re unsure about an account, ask yourself, “If we lost this account, how difficult would it be to fill the revenue gap?” If filling that revenue gap would be almost impossible, then that account should be designated as a key account. 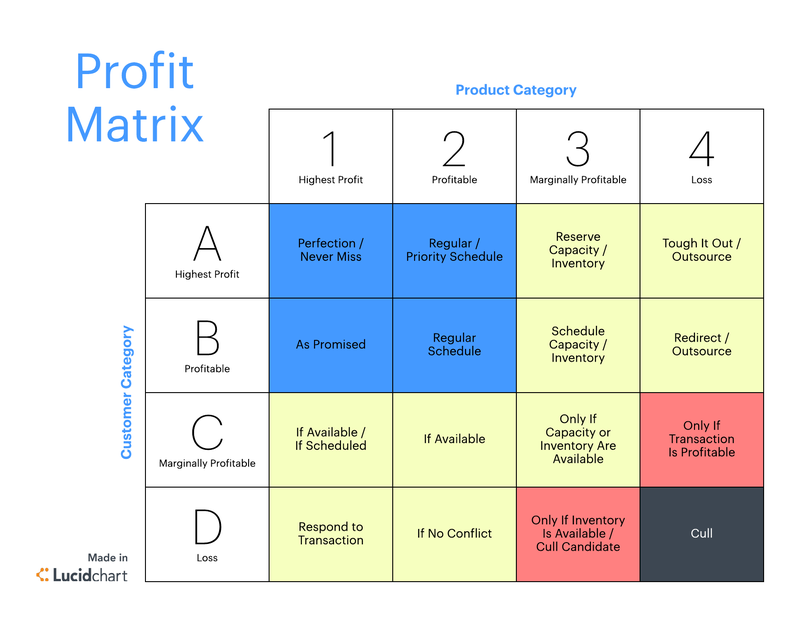 As part of the qualification process, you can use Lucidchart to create a profit matrix and determine which clients would be the most profitable to invest in. Once you have determined which accounts you should focus on, you should prioritize them based on potential profit and aligned interests. Use the matrix below to determine the type of key account management that will fit each client. 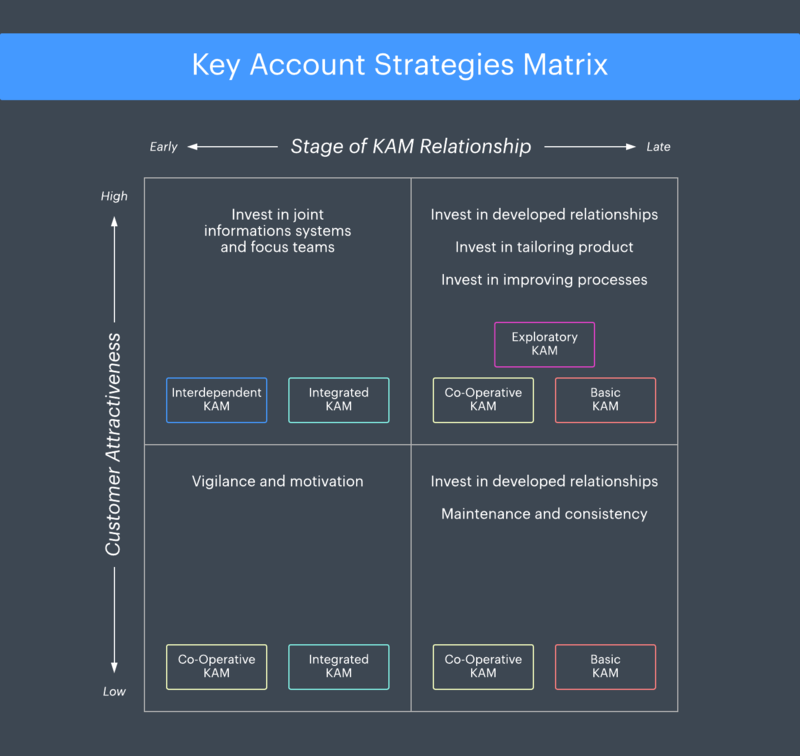 As part of your KAM strategy, you’ll want to ensure that you have a firm grasp on the key players within an account. Early on, you’ll want to know who the strong influencers and potential buyers are in order to optimize your time. And don’t limit yourself to just one point of contact within the business—nothing puts an account at greater risk than having just one contact. Studies show that businesses rarely sell to just one individual; rather, they sell to a group of decision makers who hold different positions throughout their entire company. Part of a strong key account sales strategy should involve contacting each of these decision makers and discussing the benefits of your solution. Your contact list can get pretty long—and complicated. 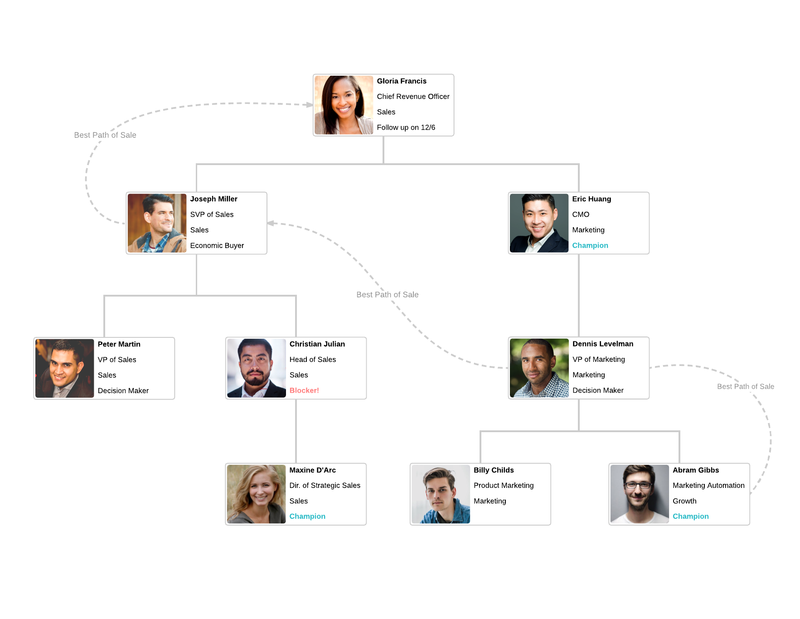 To keep your contacts organized, build out an influencer map. This visual will help you figure out whom to talk to, where they fit in the company hierarchy, and with whom you should align to improve your business relationship. As previously mentioned, one of the primary objectives of key account management is to build lasting relationships that benefit both your company and the business. Strengthen your relationship by showing how you can add value to your client’s company. Adding value can happen in various ways, such as saving the company money, bringing in more revenue, managing risk, mitigating competition, and building deeper relationships with account members. As you continue to invest in the success of your partners, you’ll help each other to add innovation and value, which ultimately results in both you and your clients becoming deeply invested in each other’s future. When you develop this kind of partnership, both parties have a better chance at success. Key account management could be a huge shift in your organization—it’s a long-term game of demonstrating continued value to your clients and growing with them. Get the necessary buy-in and streamline the process by visualizing your key account management model in Lucidchart.